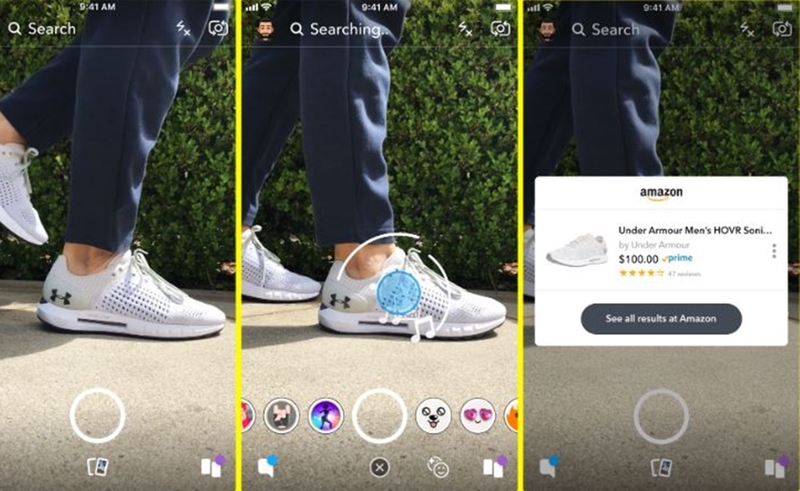 As it continues to dip its toes into the ecommerce space, Snapchat said this morning that it has partnered with Amazon on a new feature dubbed ‘Visual Search’. Rolling out this week, the feature will enable users to point their Snapchat cameras at a physical product or barcode, whereupon a card appears onscreen enabling them to purchase it — or something similar — on Amazon. Visual Search presumably aims to cut down on the browsing time incurred by online shoppers when they spot something that they like out and about. Once the card appears, users can tap a link to purchase their selections on the Amazon app (if it’s already installed on their phones) or on Amazon.com. “Snapchat has always been the fastest way to communicate,” the company wrote in a blog post, “and now it’s the fastest way to shop.” Snapchat declined to say whether it receives a cut of each sale clocked through Amazon, per Bloomberg. Snapchat has toyed with ecommerce in the past, though it remains to be seen whether it will turn around the company’s disappointing revenue figures and flagging user growth. In July, the company pacted with Kylie Jenner, offering her a swipe-up-to-buy option for one of her cosmetic launches. At the time, Snapchat said it wasn’t taking a cut of any influencers’ sales in this capacity. In June, the company began testing shoppable ads in Discover and between user-generated Stories.